Designed for fashion conscious women, this necklace will lend you a look you would love to flaunt. 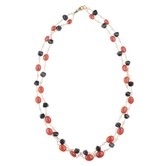 Featuring gems like carnelian, black onyx and fresh water pearl, this necklace will surely get you noticed wherever you go. Team this state of the art necklace with casual or indo-western outfits to make a distinctive style statement. It has a design that defines elegance and class, this state of the art necklace is a must have for your jewellery collection. With unsurpassed brilliance, this excellent piece has superior craftsmanship, precise cuts and complementing colour. At once striking and classy to wear this masterpiece can be the highlight in your wardrobe. Adding a little colour to your neckline, the design and style of this silver sterling necklace speaks volume of its revitalizing and overwhelming fashion advancement. A very poise and subtle necklace that is pro-crafted to keep you in sync with the latest fashion trend.